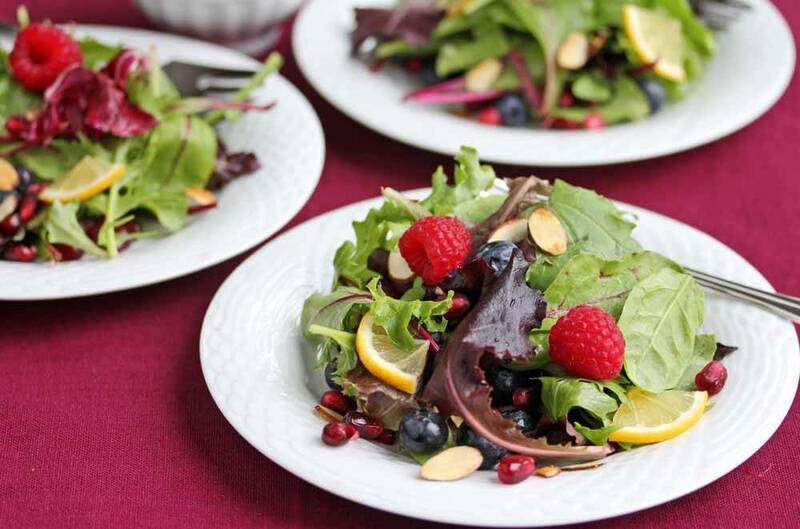 Last week, I made this Fresh Berry Green Salad with Pomegranate Meyer Lemon Salad Dressing for a Ladies’ Church Luncheon. Every year, we have this luncheon just before Christmas and it’s always a festive occasion to catch up with so many wonderful women. I always try to make a festive looking salad for this luncheon to reflect the joy that I hope this holiday season brings to everyone. I had picked up a box of Meyer lemons from Costco’s and was looking forward to trying them out in a bunch of recipes. Meyer lemons are fragrant. Their skin is bright yellow, and their juice is sweeter, not as sour as lemons. The skin of the Meyer lemon is also edible. Since I had a fruity green salad in mind, I decided to try making a pomegranate salad dressing, using Meyer lemon juice to add some acidity. Rounded out with a bit of honey, this Pomegranate Meyer Lemon Salad Dressing was fresh, juicy tasting and refreshing, perfect with the Fresh Berry Green Salad. 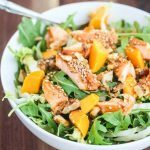 I cut up a Meyer lemon and added it to the salad, along with a sprinkling of toasted almonds to add some crunch to this simple, but festive salad. I was glad I made this green salad for the luncheon. 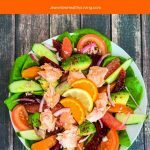 As it turns out, there were a few women who attended who could not eat dairy, so this antioxidant rich salad was all they could eat. 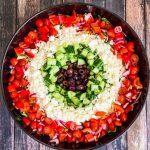 With lots of fresh blueberries, raspberries, pomegranate seeds and almonds, this salad didn’t look like a plain old green salad. It was just festive enough for this holiday luncheon. Whisk all Pomegranate Meyer Lemon Salad Dressing ingredients together. Toss all Fresh Berry Green Salad ingredients together. 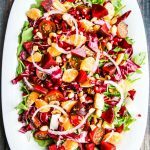 Drizzle Pomegranate Meyer Lemon Salad Dressing on top, just enough to dress lightly, and toss. Serve immediately. This is the kind of salad you expect to see in summer — bright and light — so it’s a special treat in the midst of winter. And what a nice counterpoint to the traditionally heavy holiday dishes. Yes, a little bit unexpected for this time of year, but so refreshingly light and festive enough to serve alongside more traditional holiday dishes. I ADORE meyer lemons and am so happy they’re in season again! 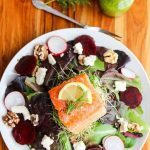 All of the fresh flavors in this salad sound delicious! Perfect for the holiday table or, with some beans added in, a light lunch! I do like the fragrance of the Meyer lemons and the fact that they are not as tart as lemons. 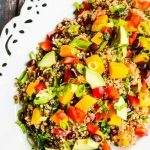 Some beans (maybe some garbanzo beans) would definitely add some protein and make this salad a meal in itself. Oh this is wonderful!!! Love it! Berries and almonds and sweet greens – a little bit of summer luxury for December! Yes, it is like summer in December. For some reason berries have been on sale around here, so I’ve been picking some up here and there. 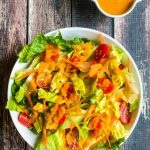 Definitely perks up this salad, and they are so good for you. Jeanette, you always have the most drool worthy pictures. This salad looks great. I think I need it after all the cookies I have eatten in the last couple of days. Thanks for sharing. Thanks so much Veronica. 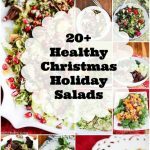 Yes, this salad will keep us all on the right track (or back on track) during the holiday season! 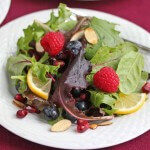 Sounds so nice and refreshing, love the beautiful bright colors of the berries in the salad. 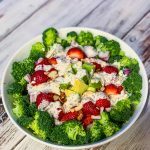 Thanks Sylvie – berries are a special treat this time of year, and certainly brighten up this salad. it looks so simple yet delicious, I really like the combination! 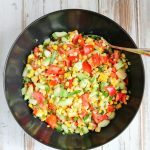 What a delightful colorful salad, love the berries and the dressing is very unique and delicious! 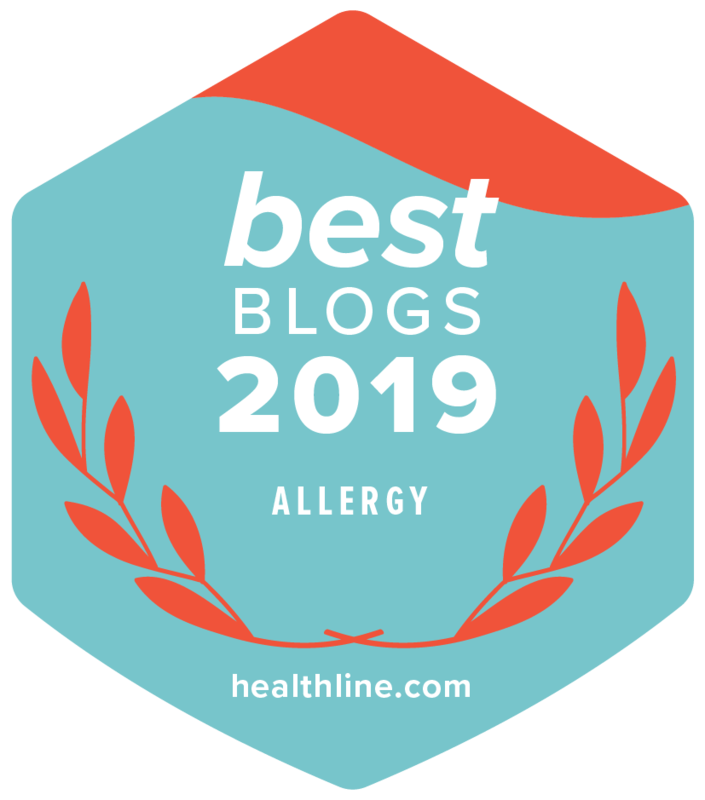 It’s my first time using Pom juice for a dressing, and I have to say it was really nice – fruity, a little tart, perfect with the berries in this salad. I love fruit in my salads! Gorgeous! Such a light and fresh salad. The perfect way to balance out the heaviness of the holidays.